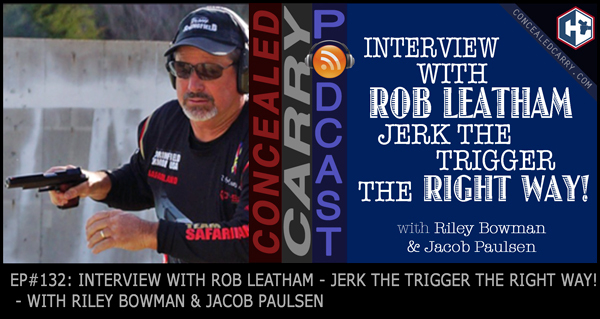 Topic: Interview with Rob Leatham – Jerk the Trigger the Right Way! Today is a special episode together with Rob Leatham where Riley and Jacob sit down with him to talk about Rob's philosophy and secrets behind shooting accurately and shooting fast! After listening to Rob you'll see that there's really only 3 things you need to be concerned with in order to master these skills. One of the things that might surprise some shooters is Rob's advocacy for jerking the trigger–but it's about learning to jerk the trigger correctly! Don't forget that Rob Leatham is also our special guest for this month's Guardian Nation Live Broadcast. Learn more at www.guardiannation.com. Press ‘PLAY' above to listen now! RAND CLP. RAND CLP features a full line of gun care products–their nano-infused lubricant RAND CLP, a crud-cutting solvent RAND Bore & Bolt, and the Heavy Applications Weapon Grease or H.A.W.G. Grease. All of these products have been torture-tested and warrior-approved by big names in the industry. One of the best things about RAND CLP is that it keeps carbon from building up on your gun’s moving parts, its signature being that you can literally wipe the carbon away instead of spending your time scrubbing and scraping all that build-up. Check out RAND CLP products today, available in our store under the Cleaning Supplies and Gun Care category for an exceptionally great price at ConcealedCarry.com.